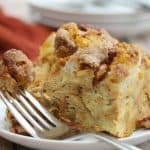 This Pecan Pumpkin Pie French Toast Casserole recipe is a make-ahead beauty one-dish meal. Really, you could not as for a better breakfast or brunch! In a large bowl whisk together the milk, sugars, cream, eggs, pumpkin puree, vanilla and pumpkin pie spice. Pour the liquid over the bread and cover with plastic wrap. Refridgerate for at least 3 hours to overnight. When ready to cook, make the streusel. In a medium bowl, combine the sugars, butter and flour and lightly mix. Add in pecans, pie spice and nutmeg and mix. Sprinkle the streusel over the french toast mixture and cook at 350 degrees for 50-65 minutes or until thoroughly cooked through. If the top of the streusel gets too brown near the end of the cooking, but still needs more cooking - tent foil over the top to prevent burning.